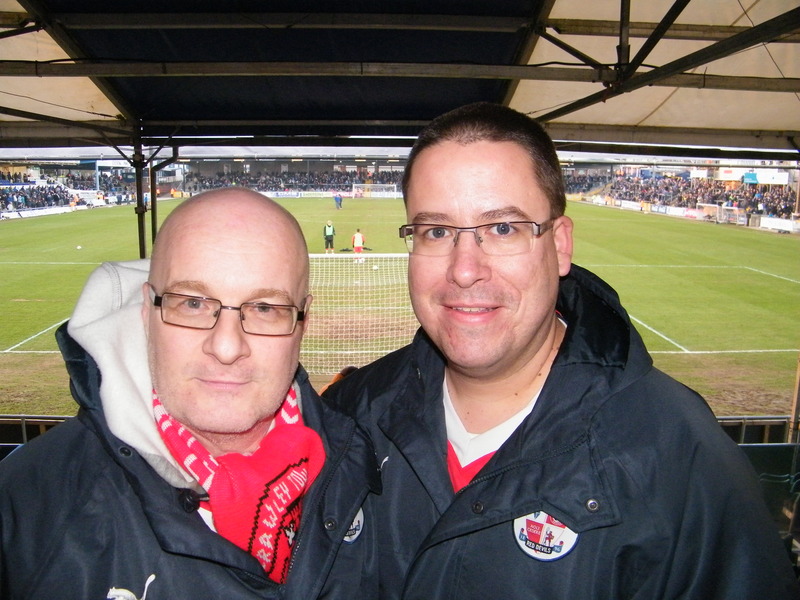 To Infinity (well, Accrington) and beyond with Ken and James, the Mystic Meg’s of CTFC! Ken and James, the public faces of CTSA Travel. Sorry. By the way, that's Ken's natural hair colour. 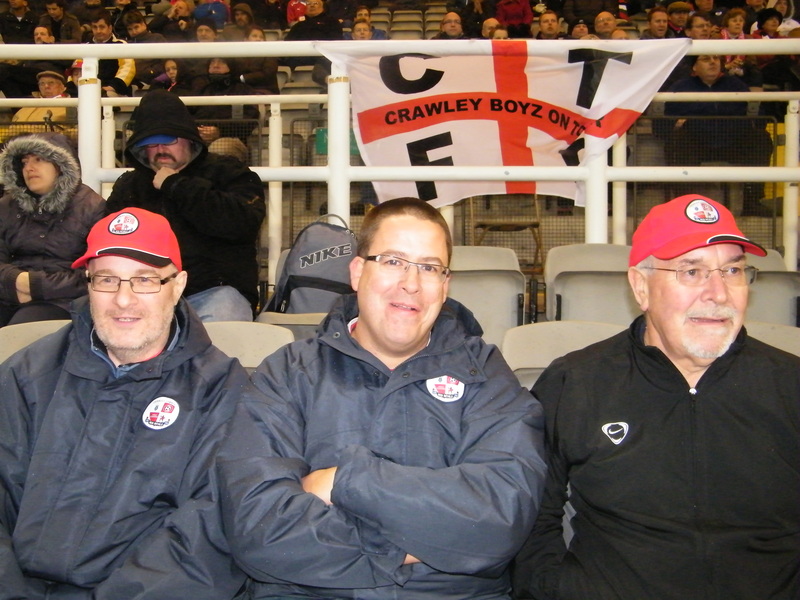 CTSA travel experts Ken Blackmore (Pound Hill) and James Laraman (Three Bridges) have gone through a steep learning curve over the past 8 months as they have organised coaches to every one of the clubs away games. Ken explained, “it’s been quite hard work at times but very enjoyable. Our key objective here at CTSA is to make away travel affordable, safe and comfortable so that we build up our away following.” He revealed, “it’s been wonderful to work with James over the past few months, I think we make a good team. He looks after liaison with our coach provider, Clarkes of London, while I look after booking and ticketing.” As to the coming weeks Ken suggested, “I expect our home form to stay solid but I still think all of our remaining away games will be crucial if we’re to achieve an automatic promotion spot”. Ken doing his famous "Larry Grayson" impression. Ask your Mum, your Dad will pretend he doesn't know! Valley Parade, Bradford is first up on Tuesday 27th March (7.45ko) It could prove to be a massive challenge for all travelling Reds fans especially given a late return. However in a generous move the club have announced free rides for the first fifty travellers, so the coach will undoubtedly be full. Those attending will be visiting the largest stadium in this league. Ken explained, “we totally understand that this trip will be tough for fans but we think the free travel will encourage a few more to come. Thanks CTFC!” James is really looking forward to his day out quipping, “I hope we get there early enough to sample a great curry!’ Bradford still have one or two issues at the wrong end of the table so expect a tough match. Ken’s prediction, a hard fought draw. Reds are back on the road to the Pirelli Stadium in Burton on Saturday 31st March. James states, “they have a lovely stadium which our fans will enjoy- and it’s not a huge distance so hopefully lots will travel north”. He’s right there, we’re quickly filling a second coach so book early if you don’t want to be left behind. Burton have been on the slide since Christmas and James is confident of a positive day. James’ prediction. Convincing away win. We can assure you that no alcohol was taken prior to posing for this photograph! On Easter Monday 9th April we will be at Underhill, Barnet. Its a compact, tight little ground where away fans are housed undercover alongside the pitch. With them locked in a relegation battle and us going for 3 huge points a pulsating atmosphere should prevail. 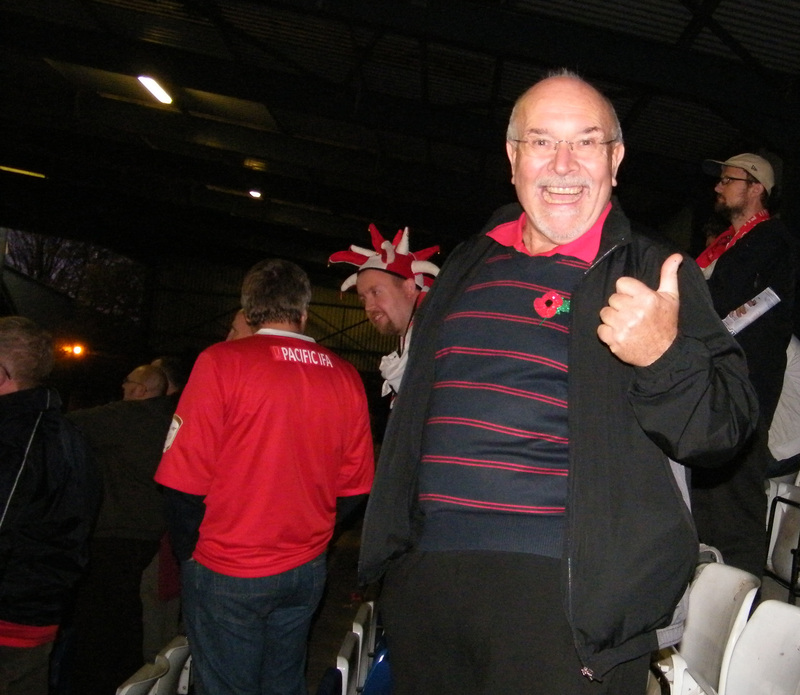 Ken predicts, “it could be a cracker but it will end with a Town win”. The coaches- and there will be more than one- leave at 11 AM, and the earlier you book, the better, as demand will be high and we don’t want to leave anyone behind! 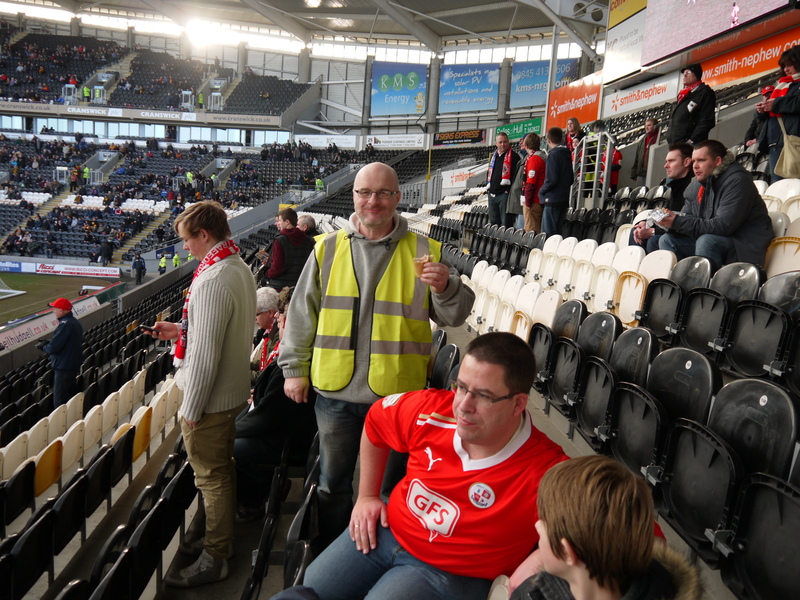 James at Hull- sorry about the chap behind, he's suffering from altitude sickness due to being too far north! Our visit to the Victoria Road Stadium Dagenham on Saturday 21st April could draw the biggest league away following of the season. It’s just a short hop into East London. Away fans will be housed in the lovely new Marcus James stand behind the goal. Even though they are at the bottom of League 2 it’s sure to be a battle. James said, “Hopefully there will be a convoy of CTSA coaches, and with good support I think we could just about achieve a narrow victory- they’ll be scrapping for every point”. James’ prediction. Narrow away win. Don't they make a lovely couple?! Our season curtain closer on Saturday 5th May see’s a trip to the Fraser Eagle Stadium, Accrington Stanley. Hopefully, fans will be making the very long trip north in party mode having secured automatic promotion earlier. Taking an umbrella is highly recommended as the area receives a lot of rain and away fans are housed on the uncovered Coppice Terrace. Both Ken and James feel it could be the day that automatic promotion is secured, but both hope we’ve secured it earlier than that! Ken and James’ prediction. A dramatic win to seal automatic promotion ! Travel. It's an exhausting business! CTSA invite you all to come and share these trips with us! So, how do you book? 1. Visit CTFC reception during office hours. 2. Calling or texting Travel Ken on 07843124845, or emailing him via travel@ctfcsa.co.uk -but please don’t try to make a late booking via email! 3. 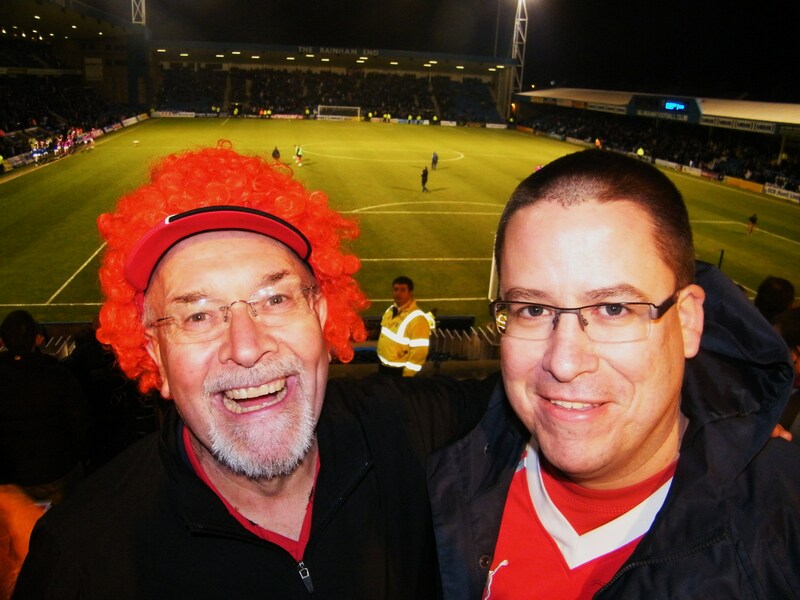 See Travel Ken at the CTSA Cabin (the large red structure opposite the club shop) before or after a home match. 4. Grab Travel Ken or Travel James before or after (or during) any away game, or on the coach! But be careful where you grab them!